Filipino street food was celebrated in Lasang Pinoy! Lasang Pinoy 3 was an Extra Challenge for most Pinoy bloggers, who grew up with dire warnings on how unsanitary streetfood is. For some, it was even a case of transcending their fear factor. But I am so happy that everyone gamely went out of their "sheltered cocoons" to participate in this event. Kudos to all of us for that! 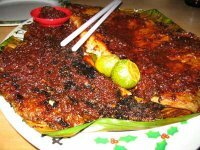 Most of the write-ups hark back to our childhoods, and we all discovered that, despite the "dirty" associations of the word, we actually grew up on streetfood. Because streetfood does not end on isaw or fishball, but comprises a wide array of regional delicacies that are intrinsically part of the Filipino food culture scene. Here are a total of thirty-six entries from thirty-one blogs spanning three continents. At least four are first-timers to Lasang Pinoy, and two participated with the first posts of their blogs. Lasang Pinoy 3. As varied as the streetside food offerings in any town and city of the Philippines. 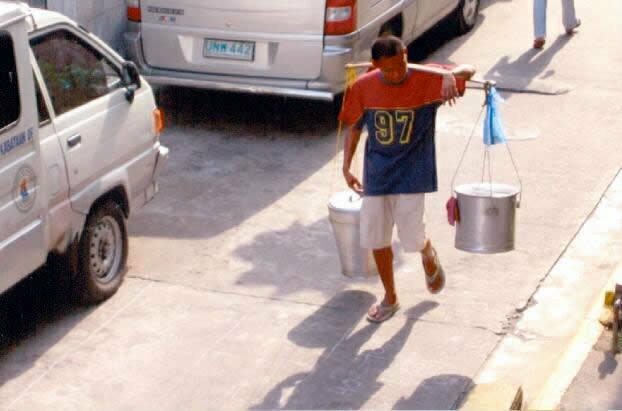 Iceman, from Quezon City, remembers trading Magnolia Chocolait bottles, Royal Tru Orange and Tanduay longnecks for cheese curls in newspaper cones from the bote-dyaryo man of his childhood in Caloocan City. Check it out at Ice Carvings. Mira likes the turon in UP, and remembers her professor's tale of "golden turon." 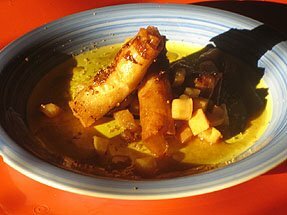 At Mirsbin's Kitchen, she created her own gold, apple turon. 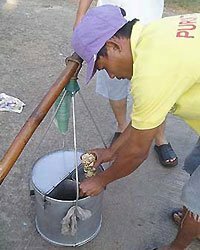 Sassy (Connie) has a very informative LP3 entry about the processes of making balut, puto bumbong and the other common streetfoods in Metro Manila, taho and fishballs, in her food blog Pinoy Cook. 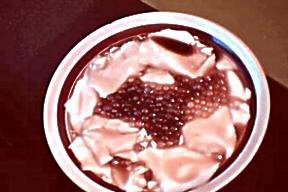 LadyCharlie loves taho anytime of the day. So What’s Cooking in her blog? Taa-hoo-o! 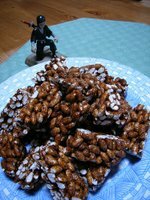 Including a recipe for making the healthy streetside snack. Over at Worthless Anik-Anik, Lani in Quezon City craves for taho, and has passed on the addiction to the members of the second generation in the family. MarketMan compiled a delectable spread of streetside fruits for this event, you’ll have a grand time reading about the history of how some of our common fruits landed on these shores, and how to best shop for good prutas. 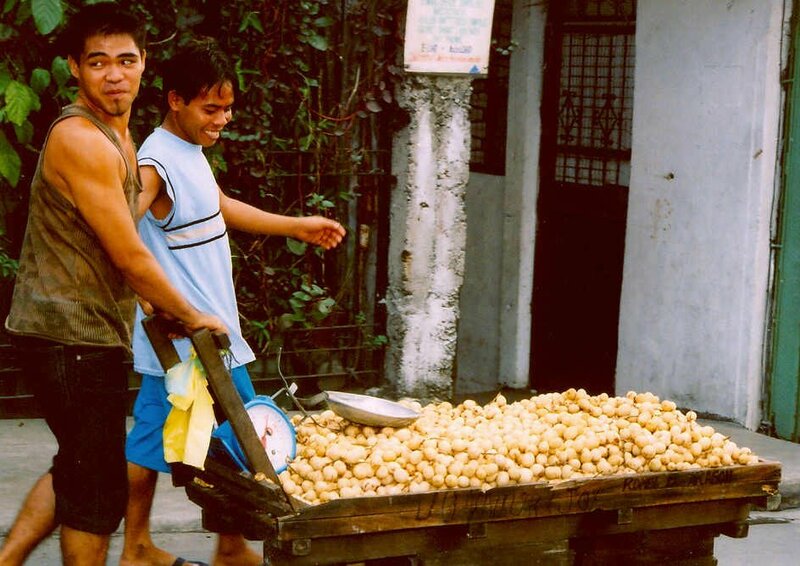 Ajay takes us on a trip to Quiapo, that veritable streetfood haven in the heart of Manila that is full of soulful/soul-less contradictions, you can practically see the Writings On The Wall. 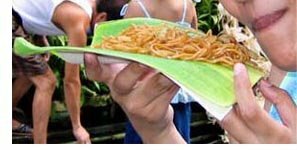 If Pinoy streetfood multiply by the minute in kind and quantity, there is such a thing as a reluctant streetfood, according to my friend Edwin who wrote about the native Leyte delicacy moron proliferating in MRT stations. Nick of Watson.Online/ craves the snow cream of his childhood days in Baguio City, but gives us a full picture, in two LP3 posts, of the streetfood scene in Makati City, where he is now based, including the night howlers and jollijeeps. A full-time law student at UP, Rinna took advantage of the semestral break to join us, recreating the streetfood scene during the Feast of Sto. Nino in tough Tondo. 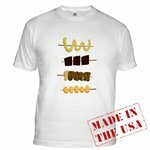 Want an isaw on your shirt? 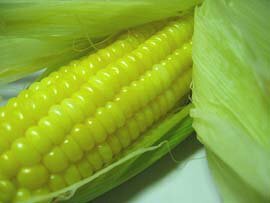 Perhaps a buco? Or fishballs to wear? Then head on over to Today, Tomorrow, and The Little Bits In-Between, and ogle Cynthia’s Pinoy streetfood creations. Maybe she’ll get you to order. Wear what you eat! 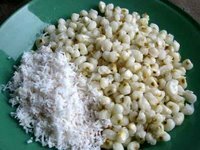 Tatang Retong in San Francisco, California recalls how tasty the forbidden "buying outside"fishballs and sago at gulaman were during his gradeschool days in Quezon City. This is his first time to join Lasang Pinoy, and he blogs at Tatang's Karinderia. Streetfood like tamales and camotecue are the local offerings in Sta. Rita, Pampanga, the hometown of Karen at Pilgrim’s Pots and Pans. 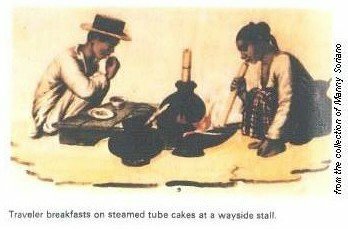 Read her post and you’ll get a peek at the historical origins of some of our common streetfood, and an understanding of why they are so popular. 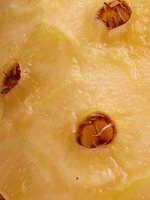 Phisch sees the marvels of God's creations in the eyes of a pineapple, bought from the numerous fruit stands in Tagaytay. Learn how to groove a beautiful pattern in In That Number. Manny, writing from Canada, says that “we are all impulsive four-year-olds when it comes to food. We want it when we want it. 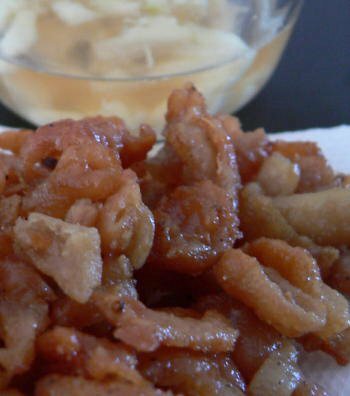 Satisfying this urgent need is streetfood’s primal appeal.” Find out how he came up with this conclusion, at the same time having a look at the streetfood scene in Bataan, plus an easy tikoy recipe, at Bewitched, Bothered and Bewildered. 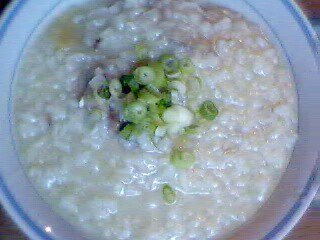 JMom, cooking in In Our Kitchen in North Carolina, laments that her kids, who grew up in a germ-phobic and sue-crazy American society, could not experience Pinoy streetfood the way she did growing up in Baguio City, particularly the ultimate street snack arroz caldo, with or without chicken, that was always a hot comfort to the stomach in the cold mountain city. Homesickness during a short teaching stint in Lucena led Minette to discover pancit habhab, which became a favorite part of her Lafang List. Accordingly, eating this Quezon streetfood is a total experience that cannot be had in other parts of the country. Kayli brings to us Laguna with its coconuts, and of course, the ultimate Laguna pasalubong from the road, bukopie! Being a Pinay in Singapore (A Foodie Paradise), she misses the fishball sauces in Rizal, as they are one of a kind, thus difficult to recreate. Calvin, a well-traveled and well-“eaten” hotelier, takes us to Liloan, the lighthouse town in Cebu where on the streets you could find a cornucopia of edible Visayan delights. 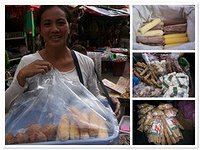 Another friend who walks in the footsteps of Doreen Fernandez tells us about the streetfood she was allowed to partake of, as well as tried to take a sneak taste of, while growing up in Daet. I wrote about my favorite Pangasinan streetfood, intemtem, or Ilocano tupig to the rest of the country. Dexie of Ilocana Chef, writing from North Carolina, remembers eating barbeque on sticks, as differentiated from the barbeque kebabs, to the tune of the romantic Pangasinan folk song Malinak Lay Labi, in her post BBQ in Stick. 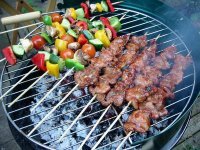 Celia Kusinera hopes to have perfected the recipe for a sizzling, truly Pinoy pork barbecue, but she thinks grilling in the UK does not seem conducive for producing the same taste of barbecue grilled in dusty, chockfull-of-jeepney-fumes Manila. 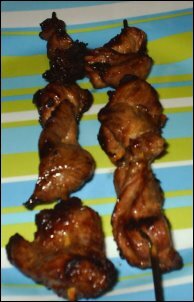 Nevertheless, she uses at English Patis an all-time favorite Pinoy recipe that’s made the barbecue our very own. Thess in The Netherlands preferred isaw, both pork and chicken, over her grandma's vegetables, eating them with rice for lunch back in the Philippines. More recently, she has also discovered the tasty tukneneng, eating both and saying Eet Smakelijk! 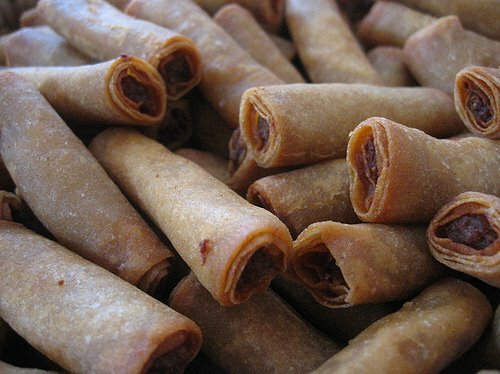 Lumpia are what Queenkv of Brainpickings munched on, on the way to skating practices and classes in college in Los Angeles. She says it’s also the best Pinoy food to introduce to non-Filipinos. 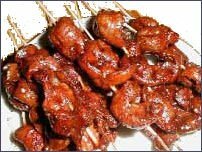 Chicken barbecue, on the other hand, are the best Pinoy party meal on stick to carry around while working the party crowd. 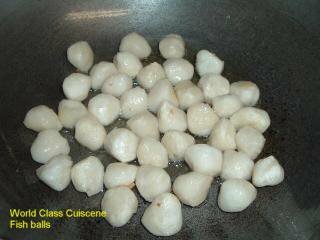 Ting of World Class Cuiscene tells us she had 20 pieces of fishballs for lunch in Baguio City, from a place managed by a doctor, so she was sure of the place’s hygiene. Nowadays, fishballs cooked at home in the US, and particularly when the family comes to the country for a visit, makes for a fun afternoon with the kids. Ces, the do-it-yourself mom in New York, has come up with her first blog entry for this event, recalling her and her daughter’s passion for binatog. Head on over to The DIY Chef and congratulate her! Atinna was lucky her Mom was resigned to the fact that her daughter wanted to eat junk food and streetfood, especially ampao and maruya. She's very happy that in Japan, where her blog Atinna in TokyoKuni is based, ampao at least can be found in most stores. Baby Rambutan’s Stel, now based in Boston, reminisces about sneaking sips of forbidden banana extract flavored sago at gulaman, and how the hubby persisted on eating seaport delicacies in the Visayas despite being previously downed by them. Peanuts, too, the healthier ones – boiled – from the loving lola from her childhood . Now those who haven't eaten ice candies in their childhood raise your hands! No hand? Santos always includes in her Filipino stash from the home country a pack of narrow plastic bags. 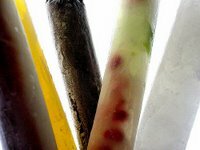 To make ice candies at home in Guam, incorporating the flavors of the Western Pacific at The Scent of Green Bananas. 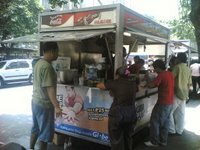 Mike was only allowed some sorbetes and pork barbeque during his childhood in the Philippines, but he discovered the tasty bopis in the jollijeeps in Makati. 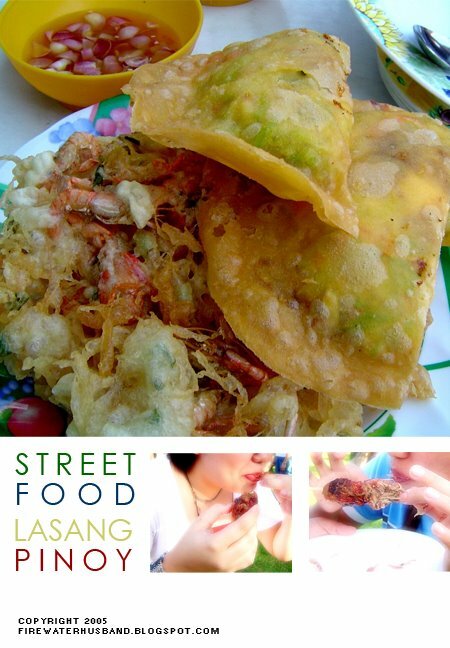 For this event he shares with us at Lafang some “tasty” streetfood treats in Malaysia and Brunei, where he is currently based. 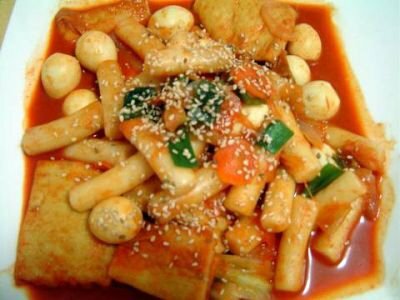 Toughened up by her former fulltime student activist days, Annabanana had no qualms about gorging on isaw, but this is sadly unavailable in Korea, so she teaches us how to make tteoppoki, the favorite streetfood of Koreans. Iska is an adventurous eater, having eaten so many kinds of Pinoy streetfood that she may have beaten all of our streetfood consumption combined. And by the name of her blog, Edible Experiments, she is also an adventurous cook. 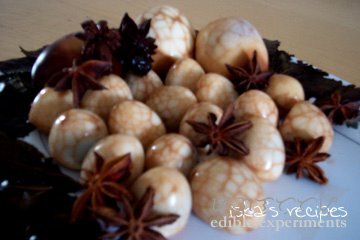 Thanks to this spirit, we can learn how to cook marbleized quail eggs good enough for Easter, sans the egg shells. But more than that, she presents us with the super exotic streetfood spread in Beijing, where she is now based. You can read about the Filipino streetfood culture/scene here. Thank you all for the "sport" spirit. 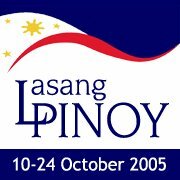 Hope to see you, and still more of us, in the succeeding Lasang Pinoy events. Mabuhay! Lasang Pinoy conceived and launched by Karen and Stef. My appreciation to Mike for the LP3 button, and Iska for the variations. 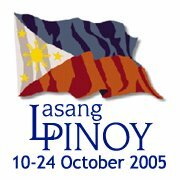 Lasang Pinoy 4, to be held November 20-25, is hosted by Minette. great round-up kai! congratulations and thanks for hosting LP3! now, who's next . . . ? Thanks for the round-up Kai! I like how it's organised - it gives us an idea of the streetfood landscape, geographically speaking. Hmmm... Mike talaga! Always on the lookout for the next host, hahaha! Great work, Kai. Galing talaga. Great round up, Kai! I'm still working my way through reading all the entries and visiting all the blogs. wow! I'm getting hungry just reading the summaries. I hope I can find some decent Filipino food in the MidWest - I just moved from California to Kansas. According to the US Census Bureau - Topeka has 179 Filipinos living there. I may be relying on your recipes to make my own comfort food. kai, 'kala ko nag-comment na 'ko dito, hindi pa pala! excellent roundup! thanks so much for hosting. great round up...thanks for hosting. more power to LP! Great round-up Kai. Well done! i had a great time reading this round-up, kai. see you all in LP4! So sorry I couldn't participate this time, Ren. This was a great grouping! I'd love to jump in again, and you've given me a great inspiration for an entry for my blog. I've been blog-blocked for a bit, being a little swamped with work. Hope you are doing well! great job, kai! 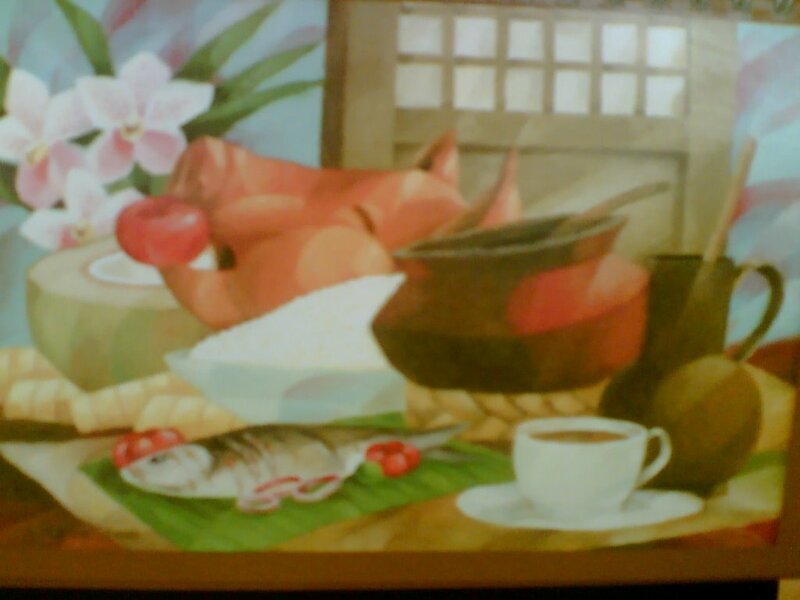 i'm looking forward to more lasang pinoy activities. and thanks for welcoming me into the fold. HEY! ang dami nang food d2! help nman peeps. 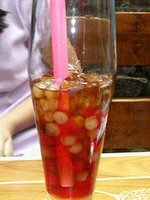 can you guys give datas or this what you called nutrition facts of TAHO. Calories, carbs, protein and fat content details, say for one cup! 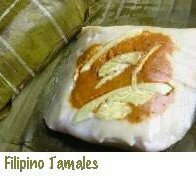 i am also taken by the photograph of that tamales..
i dont think i have tasted one yet..
hahahah.. where can i find that? Hi, Kate, turon - the common kind with saba banana and maybe some langka, is vended by "mobile manangs," walking around the campus, or setting up shop (sitting down in alleys) at the Shopping Center. Mira's golden turon is her own creation - you can make one yourself by substituting the banana with apples. 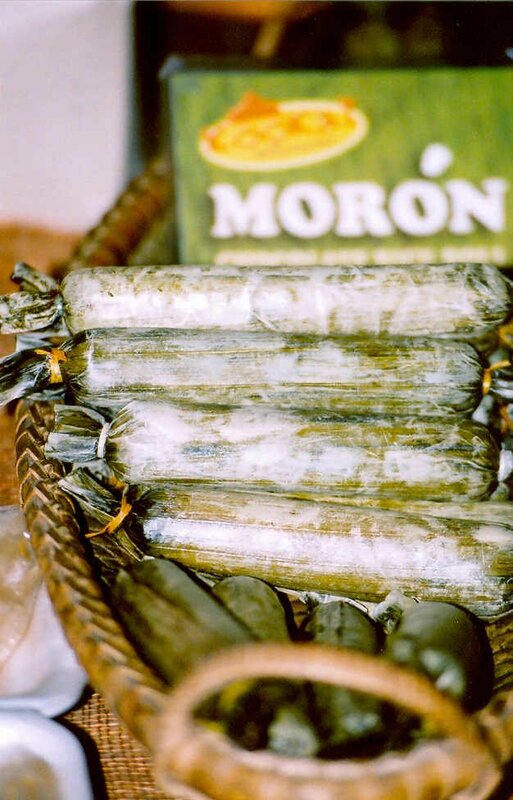 Tamales can be found in food outlets and markets of Pampanga.